French goalkeeper Bertrand Bossu has signed a two-month contract with Crewe Alexandra following a successful trial. 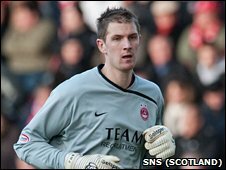 The 29-year-old former Aberdeen keeper is now awaiting international clearance before making his debut for the Alex. "I've not played since May and I just want to get started. I'll give it my best," Bossu told BBC Radio Stoke. Caretaker manager Dario Gradi added: "He's not played a lot of games, which concerns me, but that's why we've only offered him a two-month deal." Gradi continued: "He's the biggest keeper I've seen in a long time and is very experienced." Bossu has played for 11 clubs, including Barnet, Gillingham, Darlington and Walsall. He made most of his senior appearances at non-league Hayes between 2001 and 2003 after joining from Barnet, where he began as a trainee. Crewe have used four goalkeepers so far this season - David Button, Adam Legzdins, Steve Collis and Adam Bogdan. Tottenham Hotspur keeper Button was recalled from his loan spell at the Alexandra Stadium on Tuesday.